INDEX - Click or Tap to Open or Close. 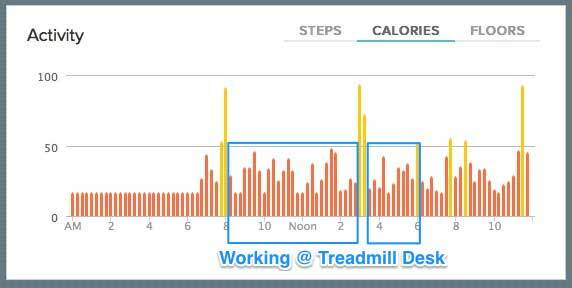 The concepts behind “Learn how to Workout at work to reach 10k steps every day” have been hiding in plain sight. In most cases, they are small changes that can be made to one’s existing work-life, that cost little or nothing to implement. So why did it take me 48 years to discover these work-life hacks? Sometimes, the simplest solutions are the hardest to see. There is a prevalent belief in our culture that working harder for long hours will make us more productive and therefore, more valued as an employee. You have a choice of working hard or working smart. These choices aren’t mutually exclusive. You can work smart and work hard but just working hard, isn’t working smart. While I was in the corporate world, I believed that I needed to be at my desk as many hours as possible to prove my worth. I was working hard not smart. Was the work I was producing as inspirational as Beethoven’s or as impactful as Charles Darwin’s? How about as revolutionary as Steve Jobs’ work? Did you know that Beethoven would work in the mornings and wander the streets of Vienna with a pad of paper and a pencil in the afternoons? Charles Darwin had a gravel path installed in his home so he could count the number of laps he’d walk to solve a problem. Steve Jobs was famous for walking the streets of Palo Alto for meetings, exercise, contemplation, and problem solving. What did these great minds know that you and I don’t? They understood that to get the best work done one has to engage as well as release one’s mind. The action is like an arm curl, lifting a weight by straining your bicep muscle, then releasing it to rest. Beethoven, Darwin and Jobs understood how to sow their minds with obstacles and let the solutions grow through passive contemplation. By respecting this cycle you get the highest quality work for the least amount of effort. 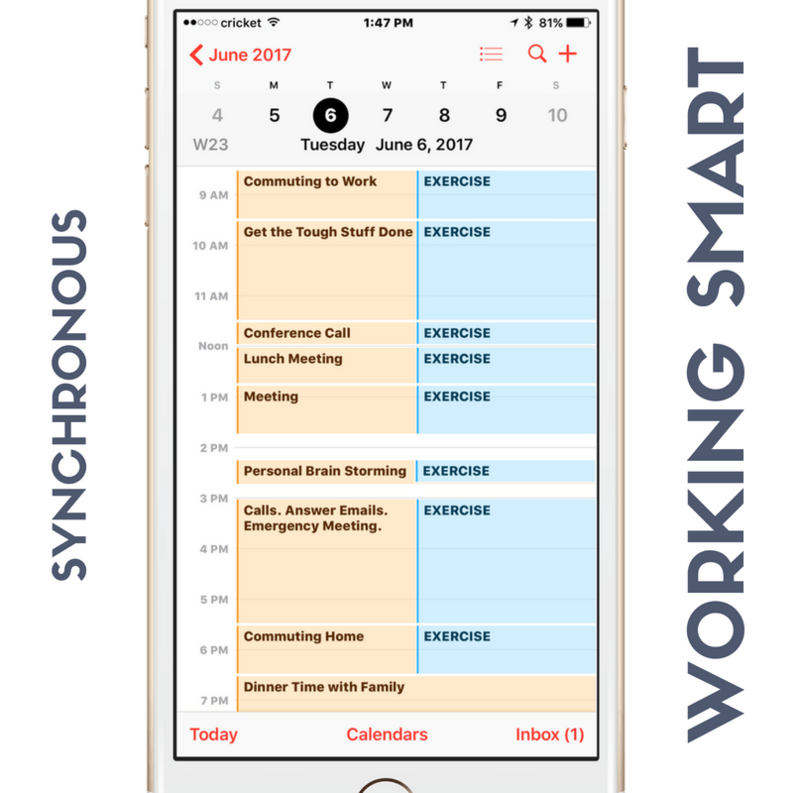 How can you organize your day to work smarter? “Jason Kanigan, a sales trainer, says you need to figure out when your “golden hours” are. Kanigan says that you have to protect your “golden hours” at all costs.” – 13 CEOs and Founders Reveal Their Top Productivity Hacks, Inc.com. Golden hours refer to your unique cycle of daily productive time. These cycles are interspersed with periods of time where you are trying to punch through a fog of fatigue, lack of focus or broken attention. I tackle the big stuff during my “golden hours,” (in the morning) and work on smaller less demanding tasks in the afternoon. Utilize your golden hours and take breaks based on your ultradian rhythm. You will find a productive flow in your work with less strain against the natural cognitive decline as your brain tires during the day. Up until late 2012, my professional life consisted of sitting working on a computer or sitting while attending meetings or sitting while on the phone. I occasionally found time to exercise. Does this scenario like your current work-life? 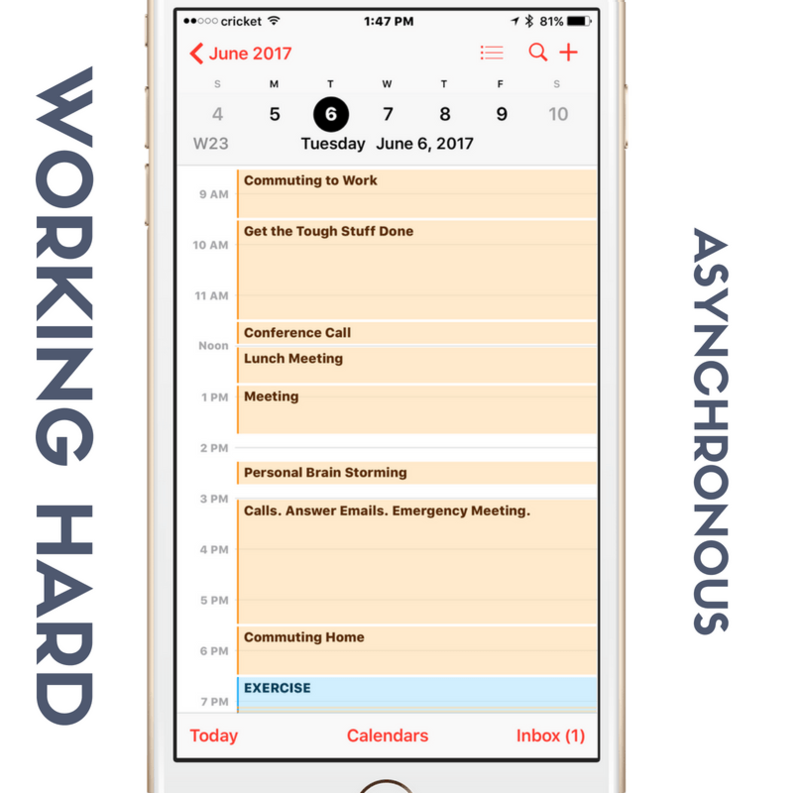 I was stuck in an asynchronous work-life. I was either working or exercising. Exercise was a time slot that could be postponed or deleted with a click of a mouse. Each delete added another ring of fat around my trunk. When I started to make small changes to the way I worked a synchronous work-life began to reveal itself. Now, everything I do in my day is an opportunity for exercise. This way I am guaranteed to get exercise regardless of whether it’s a good day or a crappy one. Immediately I saw huge health and wellness benefits. Within six months I had lost 30lb/13.6kg and to my surprise, had walked 1000mi/1,609km. Sow your mind with obstacles and let the solutions grow. Find your “golden hours” to work on the tough stuff. Use your ultradian rhythm cycles to be more effective. Maximize the health and wellness benefits of a synchronous work-life. Now let’s build “healthy & smart” into your busy life by breaking down your day into actionable steps, below. Grab the high-resolution infographic for printing or just to keep nearby on all your digital devices. There are many different ways you can get from your living space to your workplace and back. All of which are forms of transportation. Experiment by making small changes that integrate physical exercise into your form(s) of transportation. Driving is the preferred method for 91.2% of commuters in America. If this is your reality, try parking your car in a lot up to 1mi/1.6km or more from your work and walk the rest of the way. 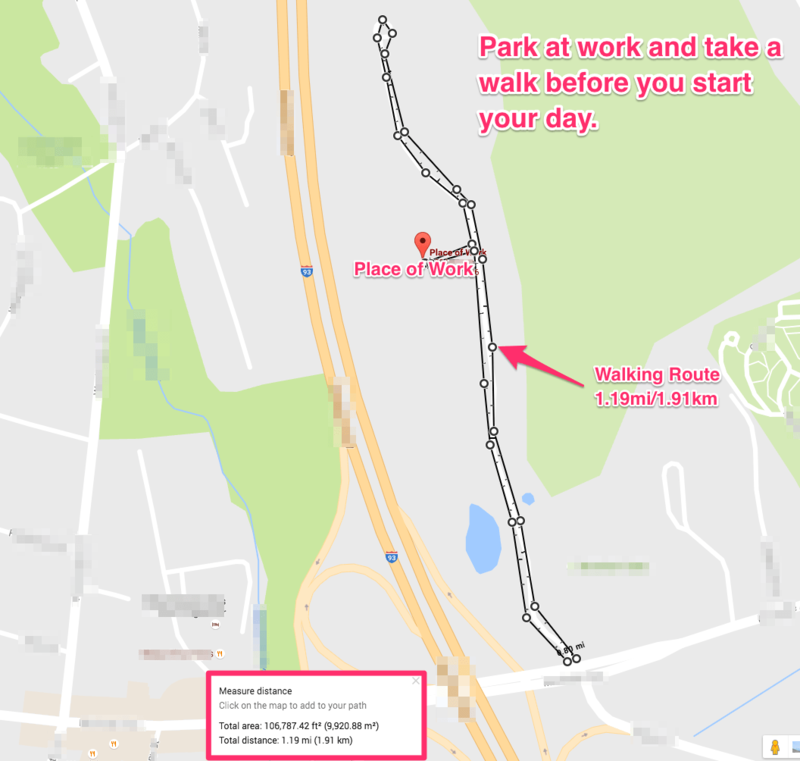 You can achieve the same result by parking at work and taking a walk for 1mi/1.6km around the area before starting your day. This small change will give you consistent exercise and time to plan the first half of your day. If you do this twice a day (before and after work) you could add 4,000 steps to your daily total. Public transportation as a method for getting to work is a far second at 4.9% of commuters utilizing it. Walking is almost half of that at 2.8%. It is tempting to just “zone out” when dealing with the daily frustrations of taking public transportation. Try an experiment and instead of waiting around for your bus, train or streetcar, walk to the next stop or three on either end of your commute. This small change is good for you, the environment and might even save you time too. Take on this challenge could add 4,000 steps to your daily total. A bike or other human-powered forms of transportation for part or all the way to work are great alternatives. In some parts of the world, this is the preferred method of transportation. Add this to your daily commute could add 2,500 (steps/or equivilant) to your daily total. How to use the Steps Estimator Panel. Click Here. Each segment of this Blog Post has a STEPS ESTIMATOR panel. 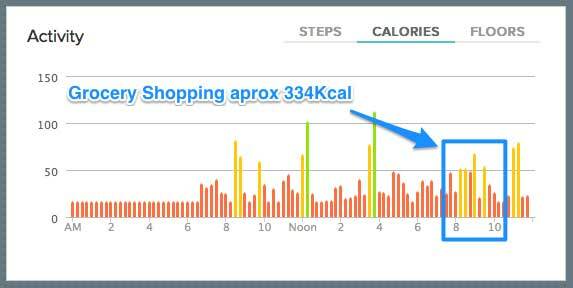 Drag the slider handle to estimate the number of steps you will take for each individual activity on any given day. For example; Tomorrow I am going to try to walk 1,000 steps “Talk ‘n Walk” and 3,000 steps “Commuting to Work” for a total of 4,000 steps. The steps entered in each of the Steps Estimator panels will be totaled and displayed HERE. Jump to the total number of steps you have selected. INDEX of all the topics covered in the blog post. How are you supposed to get exercise with only a couple dozen steps from your living space to your workspace?! The solution isn’t much different than the commute to work. Before you get to work in the morning, go out for a brisk 20-40 min walk. If you have a dog or two, take them out for a walk. Although on the surface this might seem like a waste of time, I can assure you that it isn’t and in fact it might be one of the most productive times in your day. Remember Beethoven, Darwin and Jobs? Plan your day, figure out what’s important and what’s not. Let ideas percolate up from your subconscious. This productivity and exercise hack could add 3,000 steps to your daily total. Several times a week go to work outside of your home office at a cafe or co-working space. Walk there and back. Maybe do some shopping errands on the way and increase your step count by 5,000. There is nothing better to clear your head and help digestion than a short walk after lunch. You can check in on your morning’s progress and plan your afternoon. Maybe another 2,000 steps? Taking a walk after dinner and before bed is an excellent way to clear your mind, wind down for the day and signal to your body that you are ready for sleep. If you can take a spouse, significant other or friend, check in and see how their day was, make plans and just enjoy being together for an extra 3,000 steps. I know from my own corporate experience, these beasts are like black holes; time and energy vacuums that are a challenging to stay awake in. Remember “Work Smart?” Now is a perfect opportunity to do just that. Is a walking meeting right for every occasion? Probably not, but you can get creative and use this concept in a hybrid fashion. Start a meeting in a conventional way, show slides, sales figures etc… Then break the meeting participants into groups of three or less and send each team out on a 15-minute meet ’n walk. When everyone returns to the meeting room, a member of each team can present their ideas for a group brainstorm. Start a meeting with small groupings of employees. Have them go for a 15-minute meet ’n walk, then bring everyone together for a traditional meeting to share each group’s ideas. You can try something as simple as starting a meeting with five minutes of exercise and stretching. It will shake your fellow employees out of their “meeting gloom” and bring a new level of energy and creativity to the room. Just because you’ve been doing something (sitting meetings) for decades, it doesn’t mean there isn’t a better, healthier way to achieve the same end goal. Experiment and get participants’ input. Figure out a new, better way to get to the end goal and some steps to boost your daily count. Finally, time to relax, sit down and chill. Sure you can sit down and eat your sandwich but you still want to be alert when you go over the plans with a co-worker. Take 15-20 minutes to eat your lunch, but do just that. Don’t surf social media or shopping sites. Enjoy your food, look at it, breath in the delicious aromas. Bite in, chew, feel the textures in your mouth. Enjoy your taste buds firing off with delight. The simple act of taking time and being aware of all of your senses while you eat, can be pleasurable and actually help you feel full faster. Great, now you and your co-worker can have a meet ’n walk for the remainder of your lunch break. Meet ‘n walks are also great when you want to grab a coffee and chat. You’ve got a big presentation coming up next week. You need to collect your ideas and start outlining your presentation. Don’t fight the workspace distractions you know will meddle with your thinking time. 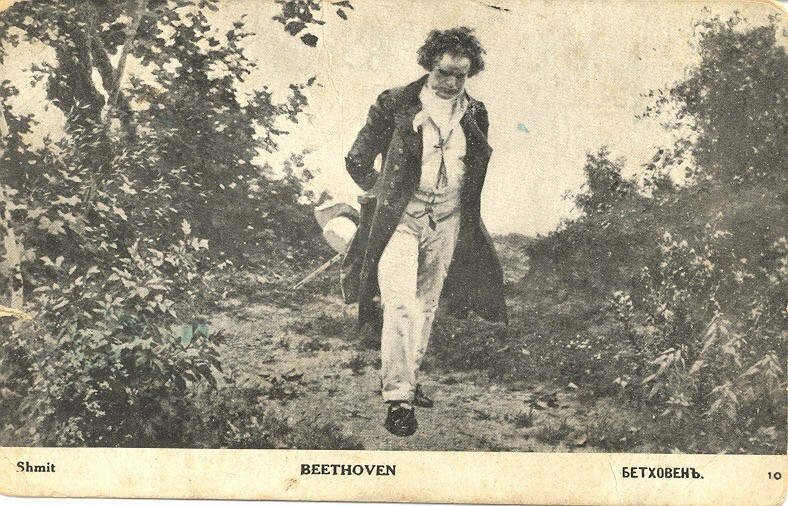 Instead, take a walk in the world around you like Maestro Beethoven. If you want your thoughts in text form, use Siri (iPhone) or Google Now (Android) and have those services transcribe your dictation into text. You can copy and paste your text notes into an outline document on a computer when you get back to the office. 30 minutes of walking will net you almost 2,750 steps. One minute of walking up stairs only burns 9cal for someone weighing 160lb/72.5kg or 16cal for someone weighing 210lb/95kg. It is pretty clear to anyone walking up stairs, that your cardiovascular system is engaged. With the perseverance of walking up every set of stairs you see, you will reap the benefits of improved cardiovascular health. For me, taking the stairs and feeling my heart pump hard in my chest is a visceral reminder that I am consistently working towards a healthier future for myself. Your day is going well and you’re wracking up steps, which is keeping you energized and alert. A scheduled conference call rings in and you slip on your Bluetooth headset. Standing up you start pacing back and forth while you engage with the call’s participants. Even though it’s mid-afternoon, you are sharp, articulate and clear-headed, because movement powers creative thinking. 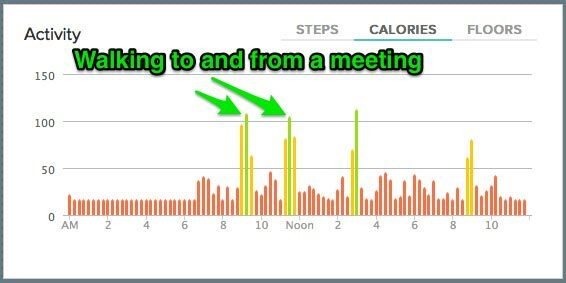 Taking an estimate of 35 steps per minute, your 30-minute conference call just boosted your daily total by 1,050 steps. Keeping well hydrated is as important to your overall health and with some smart and simple hacks, it can be an excellent tool for reaching your health and wellness goals. If you don’t know how much fluid you consume on a daily basis, you probably aren’t drinking enough. Drinking one or two 8oz/236ml glasses of water before and after you eat will help regulate your appetite and the habit of doing so, will help you consistently get partway to your daily goal. Read “How to Stop Drinking Soda. Awesome Steps for Success!” on LifehackrDiet, to learn how to switch out unhealthy beverages for inexpensive (or free) healthy ones. Most days I drink a total of 8-10 cups (64-80oz/1.88-2.36l) of liquid. I also love coffee, and as most of you know, coffee is a diuretic which means that drinking it provides me with many urgent opportunities to exercise throughout the day. The second simple hack you can apply to your work life is to harness those multiple bathroom treks by taking the long route. Find a route to a bathroom that takes 250 steps there and 250 steps back or a total of 500 steps per excursion. If you are anything like me, you can easily do this eight times a day. That means by simply rerouting your bathroom trip you just added 4,000 steps to your daily count. In about 7 work days, you will have walked a 13mi/20.9km or a half marathon to the bathroom! (1mi/1.61km = aprox 2.2k steps). Congratulations. You are a contender for the office Olympics! A standing desk is designed to be used by a person who is standing while working. Shifting from a sitting desk to a standing desk several times during your work day is a great way to start improving your health and creativity. Researchers found that sitting more than six hours in a day will greatly increase your risk of an early death.” – Eat Move Sleep: How Small Choices Lead to Big Changes By Tom Rath. Adapting your current desk into a temporary standing desk can be as simple as using a couple of cardboard boxes or an Oristand Standing Desk Converter for $39 shipped. Heck, you can even rent a fancy standing desk. A standing desk will improve your posture, and reverse some of the health problems that come with sitting all day. Working at a standing desk is not a static activity. You naturally make micro movements and can easily enhance those movements with customized exercises like the Gluteal Squeeze, Desk Pushup, and March in Place. While standing, it’s more natural to step away and pace around your little domain of industrial carpet. You already know, moving around while working allows you to work smarter and maintain your wellness. “I’ll admit that I was a bit skeptical at first — I had many questions and concerns. Would I be as productive standing as I worked? Could I comfortably do my daily tasks on my feet? I joke that a standing desk is a gateway habit to a walking desk. Because of that, I suggest that if you invest in a standing desk, it should be adaptable to a walking desk. Standing and working is a great start to being healthier and working smarter. Think ‘n Walk: 35 steps per minute x 30-minutes = 1,050 steps. What is a Walking Desk? 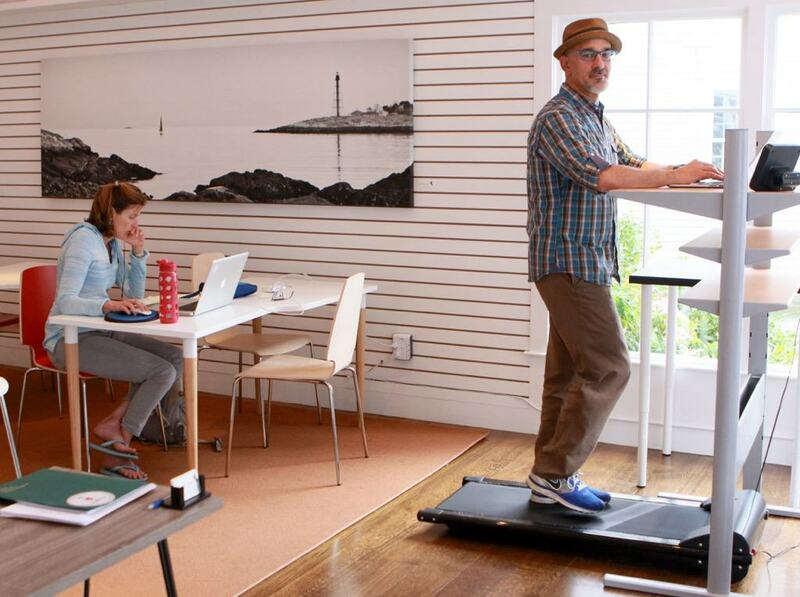 A walking desk is a standing desk, with a low-speed treadmill (motor and walking deck unit) that rests on the ground and you stand to walk on it. Author Paul showing off his DIY walking desk setup. Want to learn more about walking desks? Contact Paul. The speed of the treadmill is only 1-2mph/1.6-3.2kph which is a slow stroll. For reference, the average person walks about 3.1mph/5kph. Working at a walking desk, for most people, is not difficult to adapt to. My daily activities while working and walking include; writing, dictation, researching, reading, graphic design, website authoring and programming, photo, video, and podcast editing. I can do all these functions while walking 1-2mph/1.6-3.2kph. A walking desk solution can be a $350 DIY setup or a durable, professional solution that can cost $1,000 and up. Find out why Ron calls it a “waltzing desk” and lots of other revealing “NOI” (nuggets of info) about why moving while working is the ultimate work/wellness solution. Check out “What to Expect When You’re Expecting Your First Treadmill Desk” blog post on the workwhilewalking.com blog. To start with, you are not sitting! Moving while working has measurable health benefits. There are psychological benefits to working and moving too, like improved mood, productivity, and reduced stress. “We were able to show that these active workstations have psychological benefits without performance detriment,” says Sliter—for the most part, that is. People at treadmill desks were less bored, less stressed and more satisfied than those at seated, standing or cycling desks. Some of the other benefits I enjoy are an increased level of alertness, stamina, and creativity. “A 2014 study from Stanford University in the US has shown that people are much more creative when they are walking around as opposed to when they are sitting still. They found that when people were walking, either on the treadmill or outdoors, they were 60% more creative than when sitting around.” – Andrew Tate, Design School Canva. You have a choice, to sit, which is quickly becoming the health plague of our time, or move while working with all the health and wellness benefits that it brings. Why Should I get a walking desk? At 52 years old, even though I am prone to recurring back spasms, I walk pain-free at my walking desk. At the end of the day I don’t feel any more tired than I would have, not walking. In fact, I would say the days I am sedentary, I am more likely to discover a new ache or pain. The stamina and strength I’ve earned walking does translate to the real world. I love to hike and often do it with people much younger than myself. I am able to keep up with them and not be an embarrassment. Regardless of what goes on with my day at work (good or bad), I get my walking exercise in, mitigate my back pain, boost my productivity and improve my wellness on all metrics. The more I do, the more I can do. When I started with my walking desk, I could easily do 5-10,000 steps daily. Scott Desgrosseilliers tries out a walking desk for the first time. I recommend that people start their journey towards a walking desk by first getting comfortable with standing and working. Walking/standing desk setups range from a DIY solution to a high-end corporate solution and lots of variation in-between. A note of caution if you go the DIY route. You need to commit to making your DIY solutions work because if you don’t you will waste time, effort and money. Regardless of your price range or where your journey will end up, it makes sense to have the next possible move (towards a walking desk) in mind when you buy equipment. A good standing desk will always be an excellent investment whether you graduate to a walking desk or not. Contact any of the experts over at workwhilewalking.com to get a customized recommendation for your unique preferences and needs. Although there is a lot of information in this post, remember that every journey starts with a single footstep. The most effective way to build new habits is to commit to making one small change at a time. Repeat that action daily until it becomes second nature. Then you can add a new habit and repeat the process. Review the all the possible work-life scenarios in this blog post. Choose one to implement first. Play with the Steps Estimator panels and plan out what you could achieve, let’s say, tomorrow. Give it a try in real life. If it works for you, repeat it until it becomes a habit. If it doesn’t work, come back to this blog and tweak the Steps Estimator panels. Try it the next day and if necessary tweak it until you find a formula that works for you. If you are interested in me coach you through this process, send me an email and we can discuss your needs. Workoutatwork.co resources to help you build healthy & smart into your busy life. 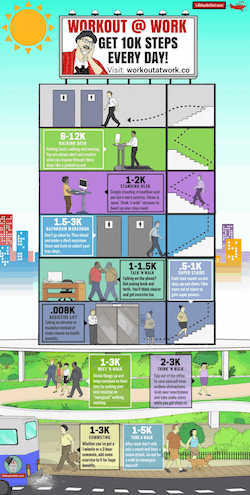 Click here to download your high resolution “Workout at Work” infographic, free. Interested in the “Workout at Work” Corporate Seminar and Workshop at your workplace? Download “Discover Your Golden Hours” personalized worksheet, free! Sign up for the “Workout at Work” eMail Course, delivered to your inbox, free! Figure out your Golden Hours with this free worksheet download. Record your energy levels for a week so that you can identify your best hours for getting the hard stuff done. Take a 2-5 minute break every 25 mins and after 4 consecutive working time-blocks, take a longer break, around 15 or 20 minutes. You can use a Pomodoro timer app to help you track your time. I use WeekPlan, a unique time management platform to manage my daily activities plus it has a Pomodoro timer built in. Give it a try for free. One of my secret weapons is that I use music “scientifically optimized to increase concentration and productivity.” I have been using focus@work for years and can’t imagine working without it. Give it a try for free. Expanding on the theme that you can’t fix what you can’t see… I like to automatically record a time-sheet of what I do on my computer(s). This keeps me honest and allows me to understand how long it really takes to finish tasks. I use TimeCamp and I love its versatility plus it integrates with tools I already use. Note: Some links in this blog post are affiliate links. The products and services they link to won’t cost you extra. LHD gets a small finders fee which helps us produce more great content for you. Thank you. © 2016, Man Mountain Productions, Inc. The Quit the Gym and be healthier for it blog post outlines many ways in which you can hack your exercise. This blog post touches on eating to lose weight and how you can gain control and change your eating lifestyle, your way. Confession; I love food and eating – I am not someone who skimps. One of my passions is trying exotic international restaurants, something I do regularly. So how is it that I was able to lose 30lbs in six months?! In my opinion, one of the reasons many diets fail is because they cart off YOUR food and replace it with their diet proven foods. These foods don’t necessarily fit your taste palette or lifestyle and are often not sustainable, post diet. This is a diet imposing change on you. On the LifehackrDiet YOU are going to make small changes to your food, that YOU feel comfortable with and eventually these will become part of your lifestyle. There are two main variables that can effect your weight; your exercise (calories out) and your food consumption (calories in). As with everything in the lifehackrDiet, you just need to make small shifts in your thinking to come up with food solutions that work for you. I’m going to give you some example food hacks that fit my lifestyle and particular tastes. 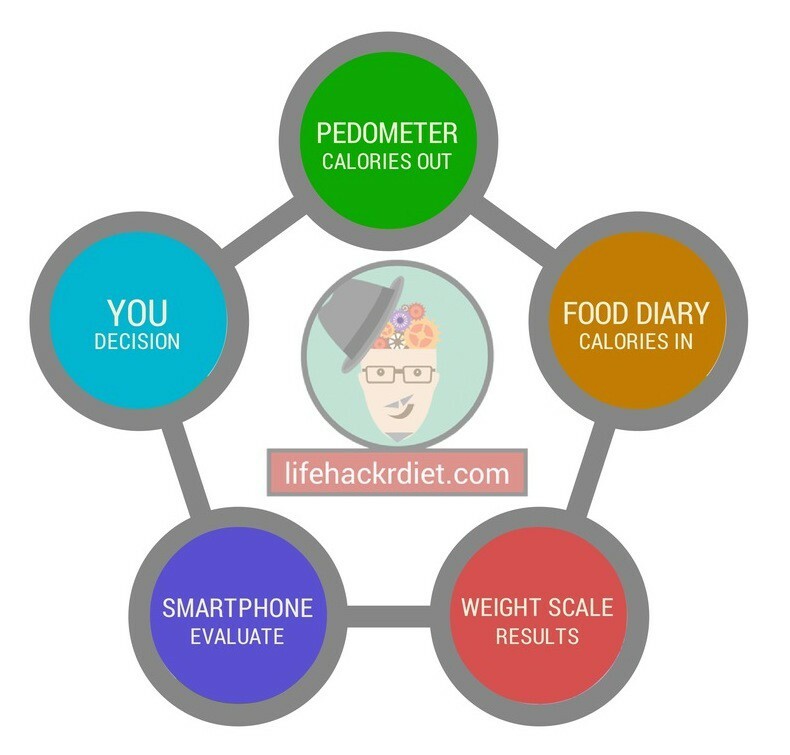 You can use them as a guide for hacking your own food..
Let’s start the unenviable job of the lifehackerDiet calorie audit. You can snack your hack or hack your snack – whichever way you like. I am passionate about this particular snack, although I’m sure I’d made a meal out of it in the past! Guacamole and chips – it’s just something that I end up eating almost every day. Until recently I ate guacamole with tortilla chips but I had the unenvious job of doing a lifehackrDiet calorie audit, something had to change. I enjoy the Yucatan brand of Guacamole which weighs in at about 100 Calories for 3 tbsp which is a nice sized serving for me. The problem was the Tortilla Chips (which are delicious and I still eat them on occasion), 15 of them are 150 Calories. When these two delicious ingredients are eaten together, I could easily consume 250-300 Calories for a snack. What’s more fun than auditioning food with a dollop of guacamole? Eating them! There were several “best supporting food” candidates; carrot sticks, cucumber spears, celery stalks, but for me the “best food” award goes to Sugar Snap Peas and Mini Sweet Peppers. You should definitely explore what you like but the result should be the same – 150 Calories cut down by 2/3 to under 50 Calories. I eat Guacamole and my chip substitute of choice daily and I have a satisfying, healthy snack that is 150 Calories or less. I have always enjoyed these two weekend breakfasts! I’m not sure if it was their taste, texture or the peanut butter and syrup I slather on top of them, regardless they are weight loss killers. A small single pancake can break the bank at 150-250 calories and that is without the fixings. I need a lot of those little pancakes to feel satisfied, so I could easily rack up a 850-1000Kcal meal! In my house we use Challah or Egg bread for our french toast and a satisfying meal also weighs in around the 750-1000Kcal range. 100Kcal for two) and my favorite fixings (a thin layer of crunch peanut butter and a drizzle of Vermont maple syrup) and I am only at 550Cal! They taste so good that even my wife and daughter have converted. So by making a small shift in my eating I have saved anywhere from 200 to 454Cal per meal. Now I love my new French Toast even more than the original style. and you can hack to your food preferences; Boneless Skinless Chicken Breast (white meat) with a Grill Mates Seasoning Blend for flavor, broiled or barbecued. The secret to prepping this meal is not to add any appreciable calories with the seasoning of the chicken (Grill Mates adds 5 Calories per serving). 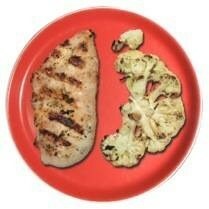 Marinades, butter, oils and the likes will make the calorie count soar. Also the addition of a vegetables like cauliflower, asparagus, peppers, onions, zucchini, portobello mushrooms and eggplant which when lightly coated with olive oil and thrown on to the barbecue or grilled until tender, are delicious. A 5 ounce boneless, skinless chicken breast weighs in at around 140 Calories and a 10 ounce serving doesn’t even hit 300 Calories! Eat until you are stuffed and it’ll be less calories than all the junk you just shoved down your gullet in the weak moments, earlier in the day. I seem to be making a lot of confessions on this blog. It must be that talking about food on a diet blog is cathartic or something. But here comes another one; I am addicted to Dark Chocolate and I love(ed) gooey chocolate ice cream with fudge chunks, bits of dark chocolate, veins of chocolate fudge, chocolate covered nuts…ahh. Bet you can guess that this sort of dessert is not conducive to losing weight! Let’s take the finest as an example; Ben & Jerry’s Chocolate Fudge Brownie ice cream – The cadillac of ice cream. A small 1/2 cup serving weighs in at 279Cal and who can stop at just 1/2 a cup! This is pure heaven but if you can stop somewhere between a 1/2 cup and 1 cup you are doing well! Let’s say a satisfying serving weighs in at around. 418Cal. Giving up good chocolate ice cream has been a gradual process over a year or so but when I discovered Dole Banana Dippers at a 100Kcal a serving I had finally found a worthy alternative. This frozen treat contains 4 banana slices smothered in a reasonable helping of really nice dark chocolate. They are cold, with a nice mouth-feel; the contrasting textures of crunchy chocolate and meaty banana are surprisingly satisfying. You need to let them thaw for a couple of minutes so there is a ritual involved in their consumption and it takes a little bit of time to eat them. So for a savings of at least 318Cal or more per dessert they are a worthy competitor for the holy chocolate ice cream. The true test is that my wife, daughter and one of my sons actually choose to eat them on a regular basis. …the contrasting textures of crunchy chocolate and meaty banana are surprisingly satisfying. If you were to switch out your regular Ben and Jerry’s ice cream for the Dole Banana Dippers 3 times a week you would be saving 954Cal, extrapolate that out to a month 3,816Cal and 45,792Cal a year! On occasion I do have a spoonful or two of heavenly ice cream but I am really happy with my hack and this summer I am looking forward to trying to make them myself. Click here to download your Free “LifehackrDiet One-Page DIY Weight-Loss”, PDF Cheat Sheet. With a couple of substitutes, you can eat anything you want at home in restaurants and with friends. Keep record of what you eat in your Food Journal and let your Digital Pedometer record your calories out – your job is to burn more than you consume. I have been able to lose 30lbs in 6 months this way with little difficulty. I don’t have any superpowers other than the lifehackrDiet technique and technology which Illuminates the workings of my metabolism and allows me to control my actions to get the results I want. These are life long habits that you are laying down and it only takes 3 minutes a day everyday to maintain your weight. There some challenging days but the majority of them are good ones – just remember the choice is always and has always been YOURS to make. Take control with the lifehackrDiet plan, today! 3 Strategies: Quit the Gym and Be Healthier! I am a work-from-home Dad with three teenage kids and I never seem able to follow through on my goals of working out. So I quit the gym and in the past year I’ve lost 30lbs and walked 2,117 miles. How did I do it? The Secrets of Eating to Lose Weight blog post outlines how you can hack your food. This blog post touches on how you can quit the gym and be healthier for it. I am a work-from-home Dad with three teenage kids and I never seem able to follow through on my goals of working out. So I quit the gym and in the past year I’ve lost 30lbs and walked 2,117 miles. How did I do it? I am sharing my experiences at LifehackrDiet blog or you can listen to the LifehackrDiet Podcast or watch the LifehackrDiet YouTube videos, ALL FREE! In a nut shell, the LifehackrDiet utilizes technique and technology to make small changes that improve your health and overall quality of life. When I went to the gym, I enjoyed myself, no problem. But what I found was between my work and home duties, the scheduled 90 minutes/three times a week would often and in fact, almost always get bumped off my schedule. I would say, “Ah, I don’t have time to do it today, I’ll do it tomorrow.” And then, tomorrow would come, another fire would need to be put out – you know the score. The result was my health kept taking a backseat to my other priorities. After one year on the LifehackrDiet this is what I had walked. I had not been to the gym! The problem was that I didn’t have a plan B – I either made it to the gym or I didn’t. I had no other mechanism for getting exercise. I just felt awful, I was gaining weight, I was always uncomfortable and I had back issues. I needed to figure out something that worked for me and my lifestyle. That was the spark that lead to the LifehackrDiet origin story. The problem was that I didn’t have a plan B – I either made it to the gym or I didn’t. The LifehackrDiet (LHD) is a series principles and techniques (utilizing common consumer technology) that you can customize for your unique lifestyle. No, it’s not based on the 1983 Police song of the same name, but you can add that song to your playlist! It’s looking at life and your daily activities synchronously. So instead of grocery shopping or exercise you have to think of it as grocery shopping AND exercise. Commuting or exercise becomes commuting AND exercise and work or exercise transforms into work AND exercise. You just have to shift your thinking and look at everything that presents itself in your day as an opportunity to burn some calories, build some muscle and get closer to your goals. Here are some concrete examples of what has worked for me and might work for you. Adapt these tips for making changes to transform your life. Acting synchronously on the LifehackrDiet plan; burning calories while shopping. 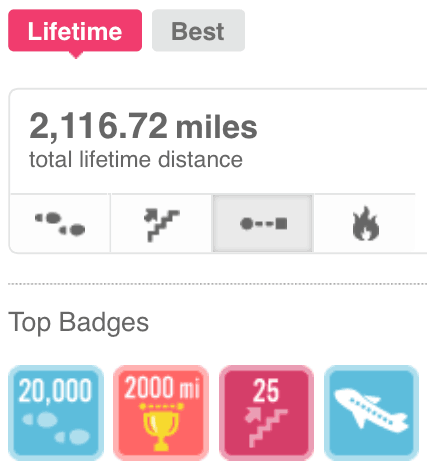 This is a screen shot of the Fitbit Dashboard captured from my account. The Fitbit One is a digital pedometer that records my steps throughout the day. It syncs wirelessly over bluetooth to my iPhone and updates my progress on the Fitbit iOS app and on the website. I love this system because it simply captures my every step and gives me credit towards my daily calorie burn. A blog posting about bluetooth digital pedometers and how to use them, is coming to this blog soon. Instead of looking at grocery shopping as a chore, look at as an opportunity to triple multi-task; shop, walk/lift and listen to music/radio/audio books or the LHD Podcast. You need one extra ingredient which is good for you and the environment; a team of strong reusable bags that will be your weights for this LifehackrDiet tip. When you go to the grocery store, instead of wasting time looking for the closest parking spot, quickly park at the furthest spot from the store entrance, I guarantee it’s available. You are welcome to be organized with a shopping list but don’t fret about forgetting something and having to walk across the store to retrieve it – it’s good for you! When you have the reusable bags packed, make them heavy so that you are getting a workout loading and unloading them. Make extra trips from your mode of transportation to your residence, lift the bags up and down as you go, bend up and down or do squats as you lift and unpack. Make the once wasted chore into a weekly workout. You will probably burn anywhere from 200-500Cal depending on your circumstances. Acting synchronously on the LifehackrDiet plan; burning calories while commuting. Fitbit Dashboard. Total for day; 19,264 or 8.83 miles or 2,969Cal. We all have our unique commutes to work so there is no boiler plate plan for getting the most out of it. Commuting usually involves some walking and lots of sitting or standing in a moving tin can. If you look closely enough you will find lots to hack. 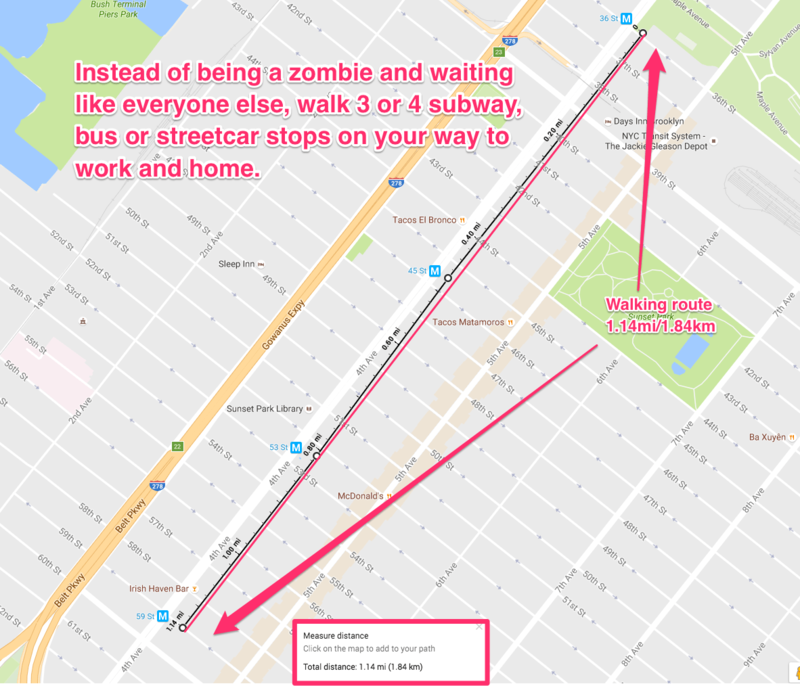 If you take the subway or a bus to work, consider walking a stop (or a few) on either end of your route. If you drive or car-pool get out or park somewhere further away from your final destination, walk the difference. Hack parking by driving to the top floor of the parking lot (regardless of whether or not there are free spots along the way) and either take the stairs or (with caution) walk down/up the actual parking level ramps from and to your vehicle. Clearly riding a bike is an obvious way of burning calories while commuting but cycling the whole way to work/home might not be practical for everyone. If that is the case is there a compromise where you can cycle part of the way and then take public transportation to finish the commute? Think creatively about your daily journey and find ways in which you can hack it so that you are healthier beacuse of it. Taking even the simplest of these suggestions could add a 1,700Cal burn to your workweek which will make a huge dent in your weight loss. Working (at a computer) AND exercising. Acting synchronously on the lifehackr diet plan; burning calories while working. Fitbit Dashboard. Total for day; 19,728 steps or 9.05 miles or 2,828 Kcal. I purchased a very simple walking treadmill for less than $250 and scoured my local craigslist offerings for a specific Ikea Fredrik Standing Desk. I combined the two and for less than $350 I have a wonderful work space that allows me to walk while I work. 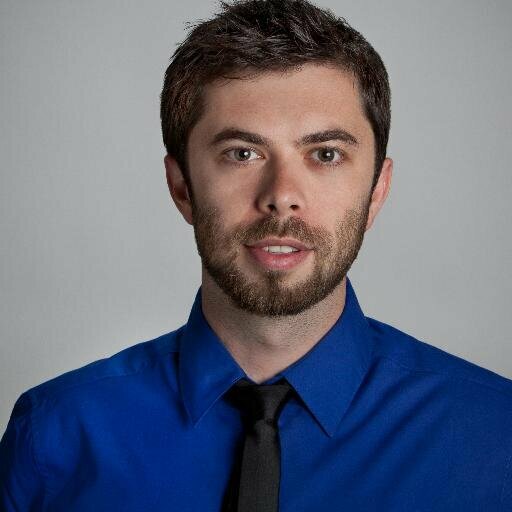 I do all kinds of things on the computer from photo retouching, video editing, emailing, writing (I am walking as I write this) with absolutely no difficulty. It takes about 3 mins to get used to the feeling and in under a day you won’t even realize you are walking while working. I walk at about 1.0 – 2.0 mph and I take regular breaks where I am standing and working. My working days are shorter than the average (due to team Michaels’ duties) but I can get 5 miles in without difficulty. That’s just under 200Cal an hour which doesn’t sound like much but when you walk 5 miles that’s about 500Cal a day or 2,500Cal a week for free! To lose a pound of fat you need to burn 3,500Cal, using the treadmill desk you are 70% of the way there. Blast through those calories with a walking desk DIY with Ikea Fredrik Standing Desk. After six months on the LifehackrDiet I had lost 30lbs doing and eating what I normally did with a few small changes. When I say “Quit the Gym and Be Healthier” you can now see why. Although I would love to go to the gym and when I can, I do. The way to make a real difference for your health is by utilizing every waking minute as an opportunity for exercise. The way to make a real difference…utilize every minute…for exercise. Everyone can do this. Be imaginative and come up with ways to make everyday chores an opportunity for improving your health. The way to make a real difference for your health is by utilizing every waking minute as an opportunity for exercise. How your host, Paul Michaels lost 30lbs and walked 1000 miles in 6 months. How to transform grocery shopping into a workout. We all have commutes to work, here’s how you hack it. 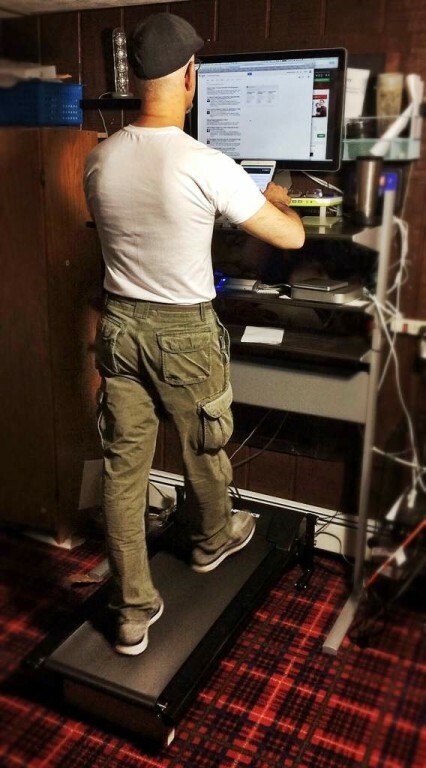 Working at your computer can be a workout too! PLUS MORE on how you can make small meaningful changes to your activities…. Amazing Reusable Ikea Shopping bags. I purchased a very simple walking treadmill. Ikea Fredrik Standing Desk. Check your local Craigslist listings.